roles during her 5.5 years with San Diego Zoo Global, including working at the world famous Reptile House. 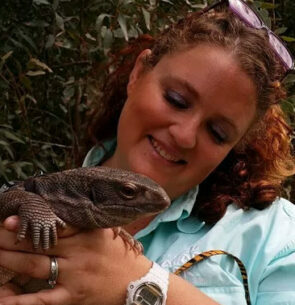 From late 2016 through mid-2018, Carrie worked as a reptile trainer and educator for the Living Desert Zoo and Gardens, with a primary focus of improving welfare for program animals through increasing choice and control. In 2018, Reptelligence expanded to create and manage the online educational group Reptile Enrichment and Training (RET). Carrie has worked closely with a variety of species from rhinos to roaches, parrots to porcupines, cheetahs to kestrels, and Tuataras to Tarantulas. She holds a Bachelor of Arts degree from Biola University is currently studying through the online program at The Ethology Institute at University of Cambridge. She is a teacher of all species and an ever-curious learner.